In terms of size, it’s a monster with those 8 buttons in the middle being as big as the usual gamepad. 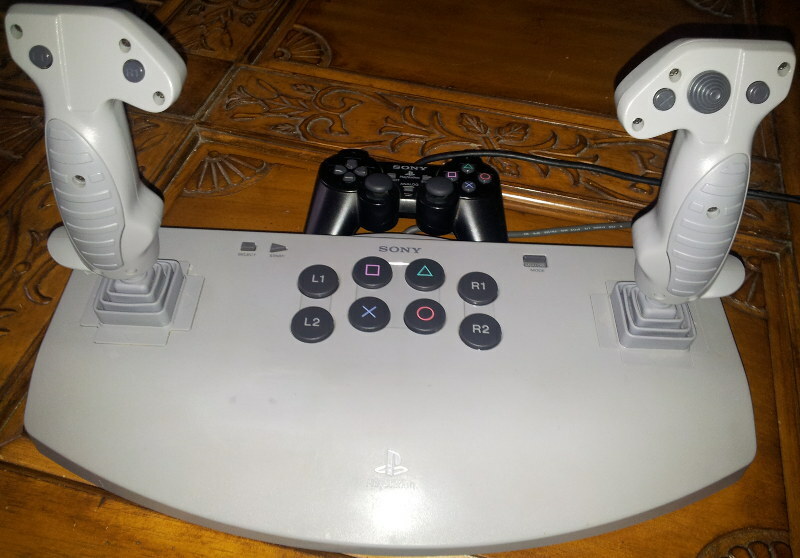 It predates that dual analog controller we’ve all come to know so well and was the first analog controller of any kind available for the PS1. Like most outlandish control peripherals, not so many games supported it in the end but it was a boon in plenty of those that did with Wing Commander 4 being one of them. All of the giant buttons in the middle are duplicated on one of the two joysticks with only the start and select buttons being unavailable elsewhere. The POV hat on the right stick equates to the d-pad. There is also a mode switch to swap between analog and digital for the joysticks – I can’t see that I’ll be using this thing to play digital only games any time soon so I’ll leave that well alone. It doesn’t appear to have equivalents to the thumbstick buttons so despite the size ends up with two fewer buttons than its miniature sibling. This is still far more than most Wing Commander console ports have to work with and should be plenty. Since it’s been weeks and I’ve got a whole new controller to get used to, I figured I would restart WC4 from the beginning again. Right from the first mission before I’ve even got to grips with the layout the difference is night and day. I was constantly oversteering when using thumbsticks but the two joysticks prove to be surprisingly accurate. Playing a game with two joysticks simultaneously is a little odd but with the giant base this thing is rock steady which is just as well when I have both my hands full. The decision to have two joysticks and not a throttle control isn’t ideal at least for this game. I can nudge the speed up and down with the left stick and it holds steady when released but this is far from natural and I’d have far more control with a real throttle. You do get used to it with some practice but I only ever know what speed I’ve got set by looking at the screen. The other minor irritation is the size of the dead zone for the two sticks. I would assume this is programmed into the game but I wouldn’t choose in a space sim to have to move the joystick so far when making minor corrections. Personally I would much rather have some drift when centered. On the whole though, it’s a little odd but this isn’t a bad peripheral at all and a lot better than plenty of other joysticks of the era. Back to the game then. After having such a hard time with the gamepad, I now found that I could now complete every mission within a couple of attempts at most so was soon back to where I had left off except I thought I should take the other branch where I choose not to follow Eisen when he defects. Given all the movies cut from this version, I’d expected this not to be included but it’s mostly there. I’ve only played this path once before so I can’t say I was overly familiar with it but more movies have been cut as I’m sure I remember some chats with Catscratch in the lounge which were entirely absent. It occurs to me that I’m up to the start of CD#3 and I don’t think Catscratch has had a line of dialog after his introduction scene. In this other path Confed start to become blatantly evil with Paulsen describing the border worlders as sub-human in a dark little scene in the officers lounge. Seether is making his presence felt in the meanwhile and displaying every nuance of the stereotype Hollywood villain other than not being played by a Brit. If you haven’t decided to defect to the Border Worlds by the time Eisen offers a second chance then you deserve what’s coming to you. Having taken that choice, the branches rejoin and Eisen heads out with his data leaving Blair in charge of the Intrepid. Playing this straight after X-Wing was interesting as it really drives home just how imprecise the controls and lasers are by comparison. In essence, I can’t do much more than point in the general direction and hope the autoaim does its job. On the plus side, the pace of gameplay is through the roof by comparison so it’s got its pros and cons. I’ve got as far as entering Pellias where there is the “jamming black hole”. By this point there have been enough cuts to the FMV and missions that I’m not going to attempt to list them. It’s always entire FMV clips and missions missing rather than just trimming down the original scenes. It does mean that the story ends up being rushed but I’d probably not notice so much if I didn’t know things were missing. None of this is exactly doing WC4 any favours but it still holds together. If I’d been forced to make this sort of call on cuts, I would have stripped out the branching and left as much of an intact single strand as possible. It was never the longest game to play through and after something like 90 minutes of gameplay I’m already halfway there judging on the CD count. At least what is left is up to scratch and I’m hopeful that the closing stages should be all present and correct when I make it that far for part 3. This entry was posted in Wing Commander 4 by Pix. Bookmark the permalink.